Derailed is not available through the iTunes store, but it can be easily purchased directly from us by means of PayPal. 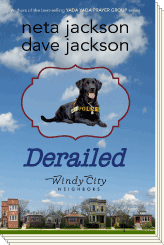 To get DERAILED for iBooks, click on the PayPal logo below the book at the right. Pay from your Paypal account or use any major credit card. Within a short time, we will send you an email with the iBook file as an attachment. Open the email in your iPad or iPhone and hold your finger on the attachment until you are asked what you want to do. Click on "Open it in iBooks or iBookshelf." Your book will then open DERAILED and it will be available on your iBooks in the future.